This is a story I wrote as one of the previews for the Dayton (Iowa) Championship Rodeo, which took place over Labor Day weekend. Boyd Polhamus is working with Randy Corley in announcing the American Royal Rodeo in Kansas City, and in about a month, they will work together at the Wrangler National Finals Rodeo. DAYTON, Iowa – If it hasn’t already happened, Boyd Polhamus is quickly becoming the voice of ProRodeo. He’s been selected to call the action at the Wrangler National Finals Rodeo 14 times, including the last 11. More importantly, he’s been named the announcer of the year in the Professional Rodeo Cowboys Association each of the last three seasons. But for folks in central Iowa, he’s meant so much more than any award can represent. “He’s certainly been instrumental in making our rodeo better,” said Jim Heckman, chairman of the committee that produces the Dayton Championship Rodeo, set for 7 p.m. Friday, Sept. 3-Sunday, Sept. 5, and 1:30 p.m. Monday, Sept. 6. “He knows what timing’s all about. He understands what a production needs to look like, to help people keep coming back. He’s been a ProRodeo announcer for 25 years, earning his stripes at events all across the country. Besides the NFR, Polhamus has been the arena announcer for big rodeos in Omaha, Neb. ; Houston; Denver; and Dodge City, Kan., just to name a few. 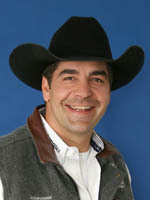 Besides his PRCA honors, the Women’s Professional Rodeo Association has selected him as the announcer of the year three times. And for the last four years, he’s made Dayton, Iowa, his Labor Day home, and that’s just fine. “I think there are a plethora of things that are special about Dayton,” said Polhamus, of Brenham, Texas. “I love the way the fans sit on the hillside. That hillside is just amazing. It’s a steep hill, and people just stack on there. For Heckman and the others who work all year to prepare for the Labor Day weekend festivities, the words are nice. But the accolades aren’t why the rodeo committee has hired Polhamus to announce the event. Polhamus isn’t the story, he’ll tell you; he’s the storyteller. He has learned the trait over the years, working with the best announcers in the business and developing his style. He’s told the stories of the greatest stars in ProRodeo, and he’s seen another generation take hold of its own legacy. He’s seen the triumph of world champions and the heartbreaking death of a friend in the biggest arena in rodeo.